The office is a place of work, collaboration, creativity, and success. It is the place you will spend long hours throughout the week, but have you ever wondered what potential clients and visitors think when they first lay eyes on your workplace? Colors, shapes, styles, and layouts may have much more of an impact on how your clients view you and your company than you may think, even just from the business furniture. Color – It may not be a large consideration when choosing your office furniture, but it may have a unrecognized impact on potential clients. Traditional dark and neutral colors – a brown desk, black swivel chair, and bare white walls – may give off the impression that it is a place of only serious intent. Brighter and more vibrant colors portray the idea of creativity and collaboration. It shows that there is more to your company’s culture than just the grind stone. Style – When creating your workplace environment, you will want your business furniture to be practical and durable, but that does not mean it cannot be engaging. Picking out seating and desks that are more interesting in design, without sacrificing comfort and utility, can add an extra element of appeal to a potential client’s appraisal. Hard edges and corners are not natural shapes that can increase the feel rigidity. Even simple rounded, cushioned seating can help break up the tense feel of your space. 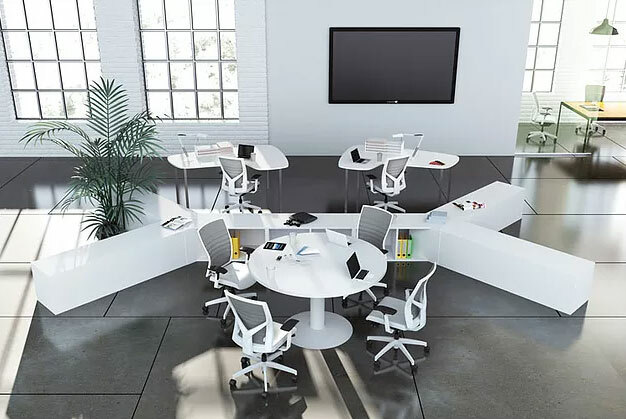 Lay Out – The way that your office furniture is arranged says a lot about the operation of your company. Stand alone desks and the amount of storage adjacent to them says that your employees are isolated to their work, spending most of their day in that single space. Even if your employees work tightly together as a team, your space may not reflect that, giving off a very impersonal vibe to visitors and onlookers. Consider creating work stations that allow for laptops to be plugged in with ease, but also show that your business stays active and interactive. Windows and Doors – Last, consider using sliding and/or glass doors to create the feel of transparency. This will show that it is an open and welcoming space. Windows are not always available depending on the architecture of your office building, but never underestimate the vibrancy of natural lighting or a view of the world beyond the office. Hamilton Business Interiors offers a large selection from a variety of manufacturers to provide all of your office furniture and other décor needs. Contact us today by clicking here to schedule a consultation! This entry was posted on Tuesday, June 27th, 2017 at 3:59 pm. Both comments and pings are currently closed.